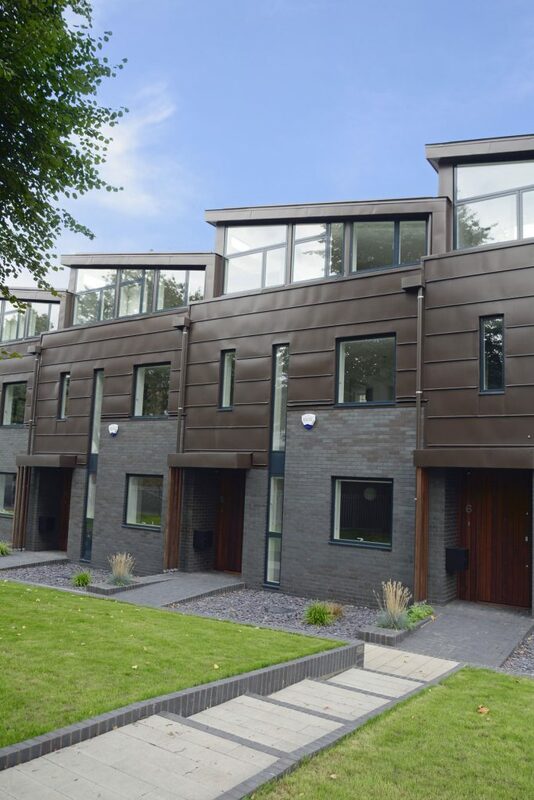 This group of six large townhouses have been developed by Bluecroft and Hanover Housing Association to help meet the need for larger houses in the area. 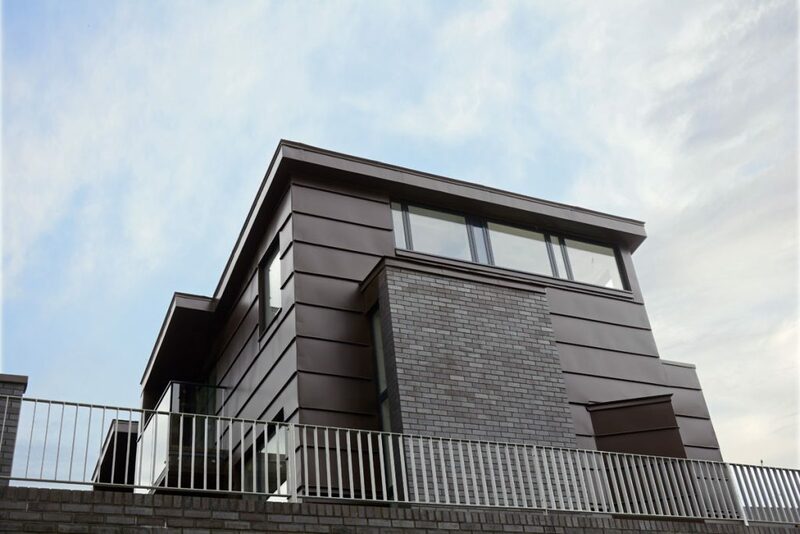 The use of elZinc Rainbow Brown zinc for roofing and cladding met the planning requirements and gives the houses a crafted, highly detailed feel. The range of houses flanks Church Walk in Stoke Newington, producing a new two storey frontage, maintaining the intimate scale of the street and providing additional green space on either side. There are a number of listed buildings in the area which is close to Newington Green, and the houses are massed to respond to this surrounding urban context, stepping back and echoing the perceived profile of the listed buildings fronting Newington Green. Choice of materials was very important in this context and the architects CH Architects have chosen Staffordshire blue brick for the lower parts of the elevation, with dark metal upper storeys. These have been executed in elZinc Rainbow Brown, a naturally pigmented zinc product from the elZinc Rainbow range. 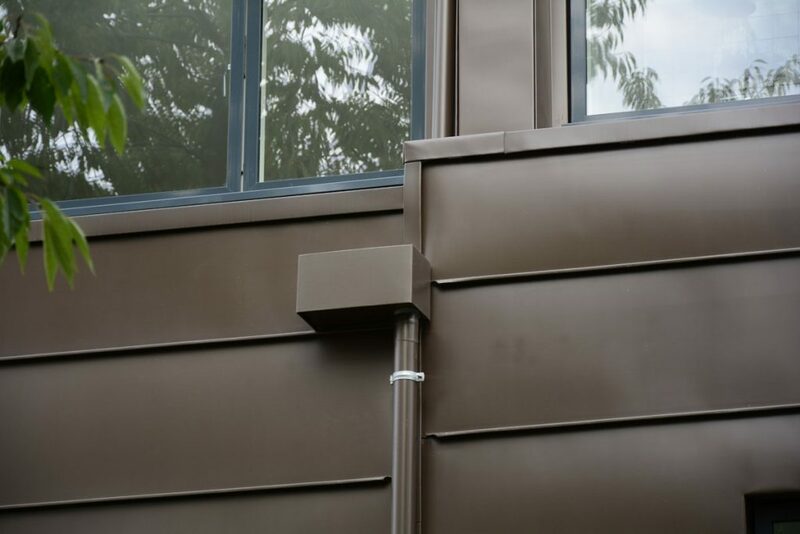 elZinc Rainbow Brown has a similar colour to some types of dark, evenly patinated copper alloy, but offers a particularly cost effective alternative when value is particularly important, without losing any of the quality of the material and its appearance. Why use elZinc Rainbow Brown Zinc? 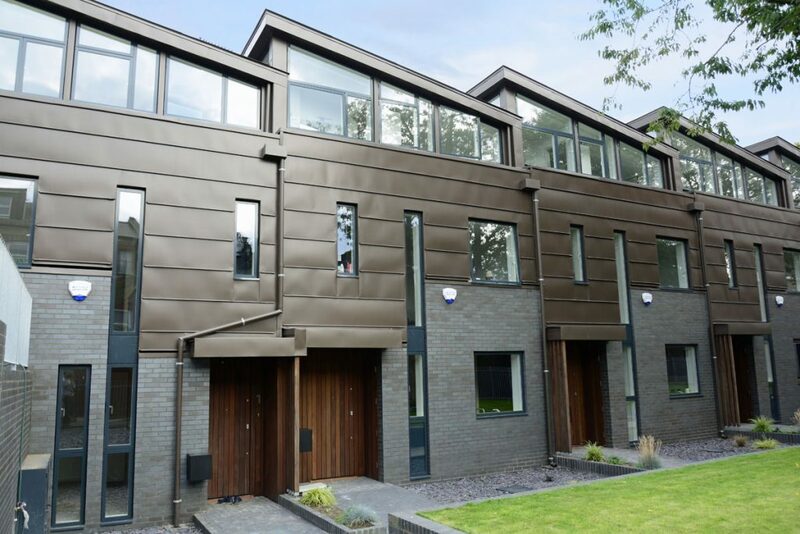 The choice of elZinc Rainbow Brown was ultimately made due to lead times – an earlier specification for the metal preferred an alternative product but this was not available within the 8-week lead time available. 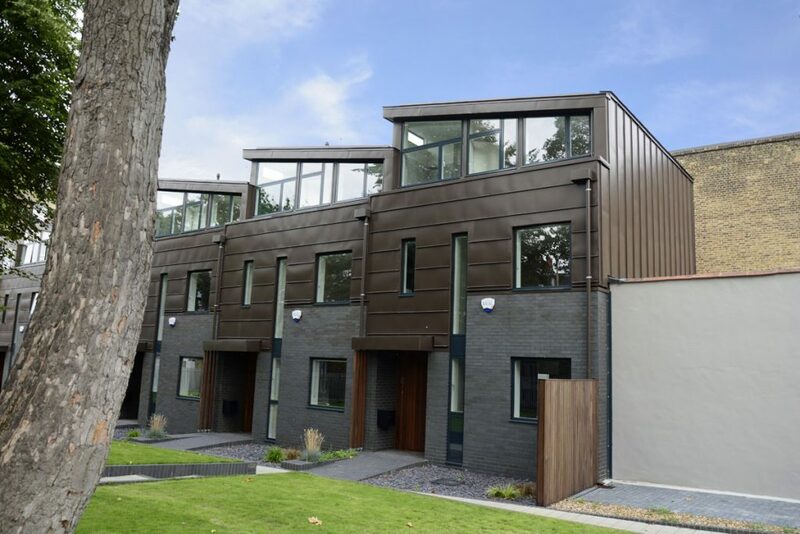 Specialist installers Metal Roof Ltd made some enquiries and with the help of metals specialists SIG Zinc and Copper were able to provide the architect with samples of elZinc Rainbow Brown. The houses in Church Walk are carefully designed to offer variety and rhythm in the façade and amenity within and without. 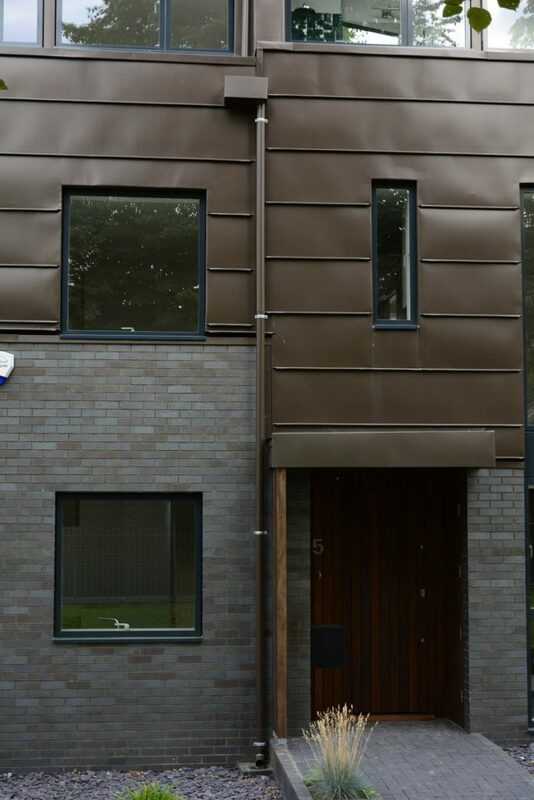 This is articulated through the use of horizontal banding in the zinc cladding, and a number of additional zinc features including balconies to the front and rear, porch canopies of the front doors, projecting box windows and visible rainwater goods, all executed in elZinc Rainbow Brown. In the gardens, small patio walls are topped with the zinc and a half capping is applied to the end of the terrace where it adjoins a neighbouring property. The design and execution of these details are essential to the quality of the finished result. 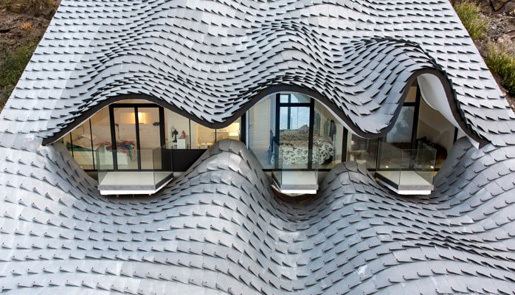 Andy has some advice for architects wanting to use zinc on their projects. 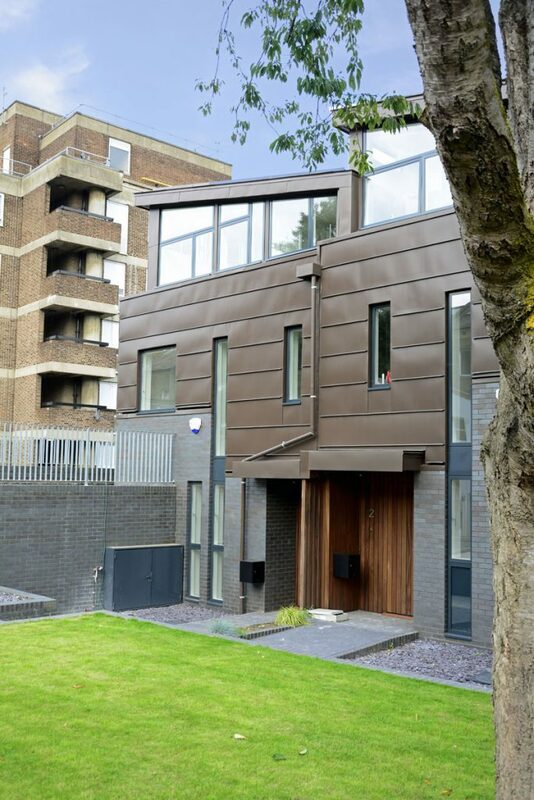 Thinking about specifying coloured zinc? Talk to the experts! Call SIG Zinc & Copper on 0844 443 4772 or contact us through the website.